Belleview Group is showcasing RM655mil worth of property at the Star Property Fair 2011 in Penang that will be held at Gurney Plaza and the adjoining G Hotel from July 21 to July 24. Group managing director Datuk Sonny Ho said the property comprised the All Seasons Park, Palmyra Residences, Bukit Dumbar Residences, and 6 Western Avenue. “The All Seasons Park, comprising 588 apartments of 856sq ft to 1,323sq ft, is about 80% sold. The selling price ranges from RM308,900 to RM524,900. 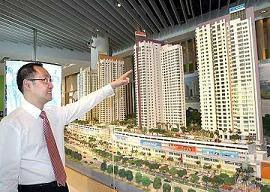 “Due to the positive response, we are launching the final phase of 220 apartments in the first quarter of 2012,” he said. “The value of All Seasons Park will be enhanced by the launching of a 45,000sq ft supermarket and 120 retail lots for its commercial hub, All Seasons Place, at the end of the year,” he added. The Palmyra Residences, comprising 227 semi-detached and terrace houses in Balik Pulau respectively priced from RM690,900 and RM542,900 onwards, is 95% sold. The project boasts of quality homes with wide spaces, tranquillity and wholesome ambience of a green and lush environment. “The Bukit Dumbar Residences, comprising 62 terraced and semi-detached houses, and 6 Western Avenue, comprising six bungalows, are 80% and 50% sold respectively. “The selling price for Bukit Dumbar Residences starts from RM1.15mil, while 6 Western Avenue starts from RM5.6mil,” Ho added. Bukit Dumbar Residences is nestled away from the hustle and bustle of city life, and its development is all about modern architectural design with space and function. 6 Western Avenue in Jalan Utama is described as a private sanctuary featuring simplicity in luxury living. Belleview is offering an 8% rebate to buyers for the All Seasons Park, Palmyra Residences and Bukit Dumbar Residences property showcased at the fair. “This means purchasers need only pay 2% as downpayment to own a property,” Ho said. He also said the group planned to launch two residential projects with a total gross sales value of RM200mil on the island and RM300mil in Alor Setar by year-end. The ninth Star Property Fair 2011, organised by The Star in collaboration with Henry Butcher Malaysia (Penang) Sdn Bhd, will be open to the public from 10am to 10pm daily, and admission is free. To date, 28 major developers — representing almost all the big boys in the industry — along with several financial institutions, have taken up booths in the fair.